“Transition – creation, maintenance, destruction” – was the title and the topic of the 2o15 Feldmár Summer University Camp. A week-long group session was focusing on the topics of migration, transition using nature and gardening as working tool. With a closed group of eleven participants the whole week we were working in the vegetable garden of the Buddhist Center which hosted the event. 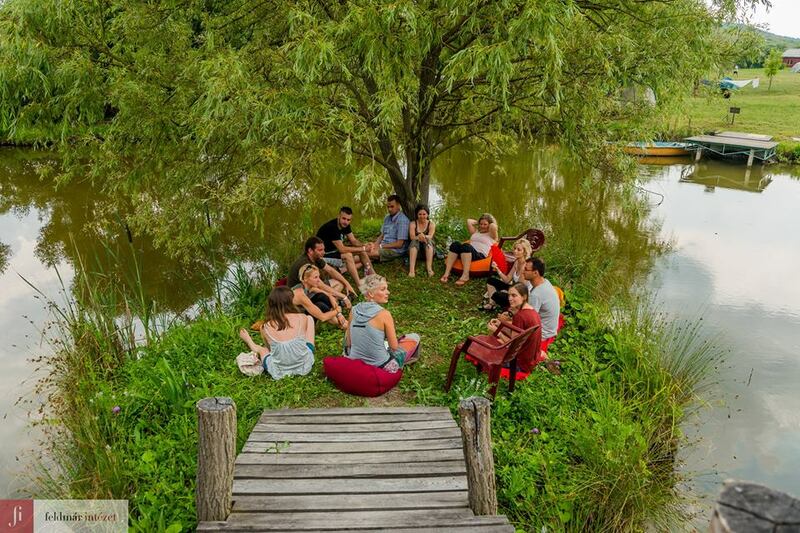 Before and after the physical work, we gathered on ‘our’ tiny island to talk about our life, our own transitions. We shared how our transition process in time and space had overlapping and interconnected impacts on our family life, relationships, intimacy, sexuality. How our new aims and lost goals, our new and sometimes confused identities, our losses and new and no perspectives triggered various changes not only in our life in general but in our relationships, had impact our man- and womanhood, our intimacies and sometimes our sexual lives. We ´used´ the vegetable garden in different ways: beyond the beautiful symbolism the garden offered for transition, care, growth, dying, the physical work also made us possible to take our time to let our thoughts, feelings flow and to find our inner silence. It also helped us smoothly to became a safe group without forcing, urging anything. We could find a nice balance in between physical work and sharing by talking, being together without words, and being alone together.